AAEM/RSA is proud to introduce the new Toxicology Mobile App, based on the very popular Toxicology Handbook by Ziad Kazzi, MD and Richard Shih, MD. This app offers a concise yet thorough guide to managing the most common toxicology related presentations you might encounter in the ED. Don’t forget to write a review so we can continue to improve upon this helpful resource for emergency providers! Get the Toxicology App now on Google Play and iTunes. 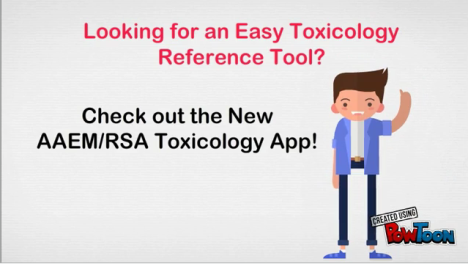 See how you can use the Tox App by watching this video!